KIBERA SLUM – AUGUST 11: A chemist and an illegal abortion doctor’s clinic, which has been in operation in Kibera since 1999. He says that poverty is the main cause of abortion. Women come to him with an unwanted pregnancy and he provides them with ergometrine and oxytocin to induce their pregnancy. He will charge 2,000 to 4,000 Kenya shillings for these pills, which include a check up after the termination is complete. Most women take the pills at their homes in Kibera when they are alone and expel the fetus by themselves without the help of a physician or nurse. 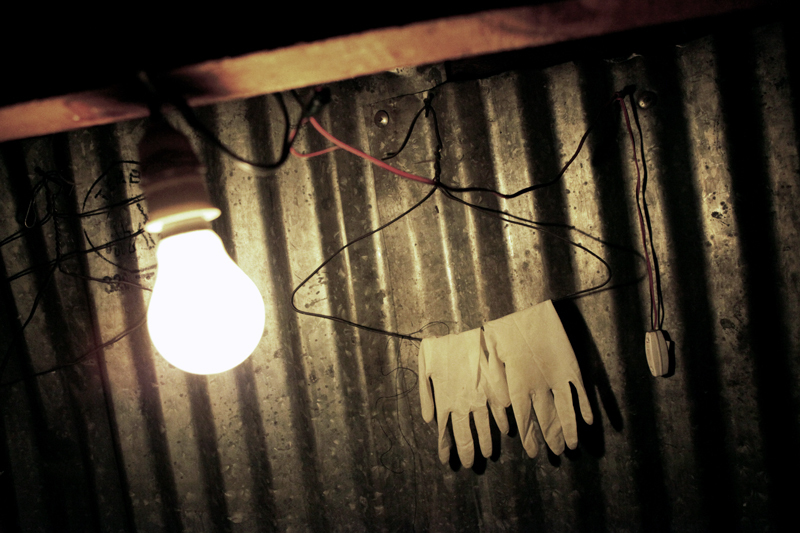 A pair of latex gloves, which are washed and reused after procedures hang dry in the chemist office in the slum of Kibera in Nairobi, Kenya on August 11th, 2010.